Steve has been a member of the BWISC since the early 1980s. He was appointed Editor and Web Master in June 2002 (relinquishing the Editorial role in 2011) and Vice-President in 2011. His collecting interest is Jamaica (almost exclusively) in which he has specialised since the mid 1970s, collecting all aspects from 1765 to 2000 (to a greater or lesser extent). He is editor (with authors, Derek Sutcliffe, David Atkinson, Paul Farrimond & Ray Murphy) of the Encyclopaedia of Jamaica Philately, four volumes have published so far with more in the pipe-line. To accompany the books a web site has been created that is continually being developed: www.jamaicaphilately.info/. 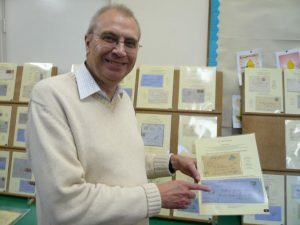 Steve is past Editor of the Royal Philatelic Society journal, The London Philatelist and is a significant contributor to the development of their web site and RPSL Catalogue facility. He spent the whole of his professional career in information technology and retired in 2006. He is married, living in Hampshire, UK and has three grown-up children (none of which are interested in philately! ).